Marina Malasheva tells us how Bulgaria was chosen by the National Geographic to take part in it’s reality show and how a foreign multimillionaire spent almost a month in the Roma community ‘Faculteta’ under cover. The Australian Finn Kelly is a businessman and despite being very young is already a millionaire. 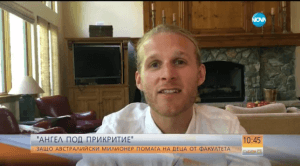 It was in Bulgaria that the rich foreigner faced one of the biggest challenges of his life. – I wasn’t completely honest with you. My name is not Nick, but Finn Kelly and I am producing a documentary called ‘Undercover Angel’. The programme is about rich people who go to different communities and find projects which they would like to support in order to change the things for the better. Everything started a few months back. Right then our country was spotted by worldwide channel National Geographic. The main character in the reality programme became the Bulgarian foundation. – There was a request that we take part in a short documentary regarding the situation of the young people in a particular community and we accepted. We didn’t have any idea that we are part of a reality show and the man that we met was very rich. In an interview for New Television, Finn Kelly admitted that being incognito was not an easy task. – Actually it was very difficult to be under cover. I don’t see myself as an angel and I am someone who always tries his best. Therefore, to hide myself was really challenging for me. One of the activities of the foundation is the integration of the children from a Roma background into the educational system. The preparation of the children in the Centre for community support starts at the age of three. – The children have language difficulties and the cultural differences are enormous. Most of the time from the very first day at school these children are already outsiders. – They start school but many of them are completely unprepared and stressed out and this is a major factor for dropping out. They give up too early. That’s why the aim when the first school bell rings is for the children to be on top of the educational system instead of being at the bottom and to remain there till the end. – The first thing that we want them to learn is the correct Bulgarian language. The capacity of the centre is very limited and many children are left without any help. The plan is for a bigger centre to be built and this will be achieved by the help of the Australian millionaire. – The reason why I’ve chosen to work with the centre for early education is that I saw the hope we give to the community. It was great! The first day I went there I saw the laughing children and how happy they were. I realised that this is how you achieve change in any community. – I felt very shocked and confused at first. The introduction was very emotional. I thought that something has happened as he was very emotional in the beginning. – I got really attached to the people that I met while I was in Bulgaria. Everyone was so warm and friendly. They invited me into their families and I feel connected to them. I know that I will keep going back and visit them in the future. A huge thank you to all our wonderful donors and volunteers for your generosity in support of the 2015 Christmas box appeal! Operation “Yellow coins” is a donation initiative of VIVACOM that supports FSCI’s “House of Opportunity” Programme in 2014 – 2015.